Several days ago I decided to post this picture on Instagram and Facebook as the creation was so incredibly delicious. It is a pasta dish which involves MACERATED tomatoes. It received such an overwhelming amount of “likes”, that I just had to make this my first BLOG post of 2017! This is a very light spring dish that, yes, I was craving in 10 degree weather. But I had a few containers of Campari tomatoes around that I wanted to use and this was going to be the perfect dish for them. Grape or cherry tomatoes work well also. Macerate is a term used for soaking vegetables or fruit to soften them or sort of marinating them, if you will, in order to release the vegetable’s natural juices and sweetness. Note that this technique typically calls for the use of olive oil. 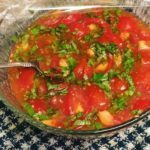 I was first introduced to this recipe about 8 years ago by Ina Garten, who uses a 1/2 cup of oil. Given the fact I don’t use oil anymore for cooking or ingesting, I had to come up with another solution. I figured lemons wouldn’t work due to the acidity against the tomatoes. I toyed with the idea of maybe using balsamic vinegar but, for me, it would have too much acid to combine with the tomatoes for so many hours. And I didn’t want the tomatoes completely broken down for this dish as there’s no “cooking” of the sauce. Finally, I decided on a cup of veg broth that is oil free. Eureka! I sliced the tomatoes in half, tipped in 6 cloves minced garlic, 15 rolled and sliced basil leaves, crushed reds, salt and black pepper. I covered the dish with plastic wrap for about 4 hours. I then cooked up some gluten free angel hair, drained it and tossed the sauce all together. I added in more salt to taste and some homemade vegan parmesan. You can add more basil if desired. The result…NO LEFTOVERS! 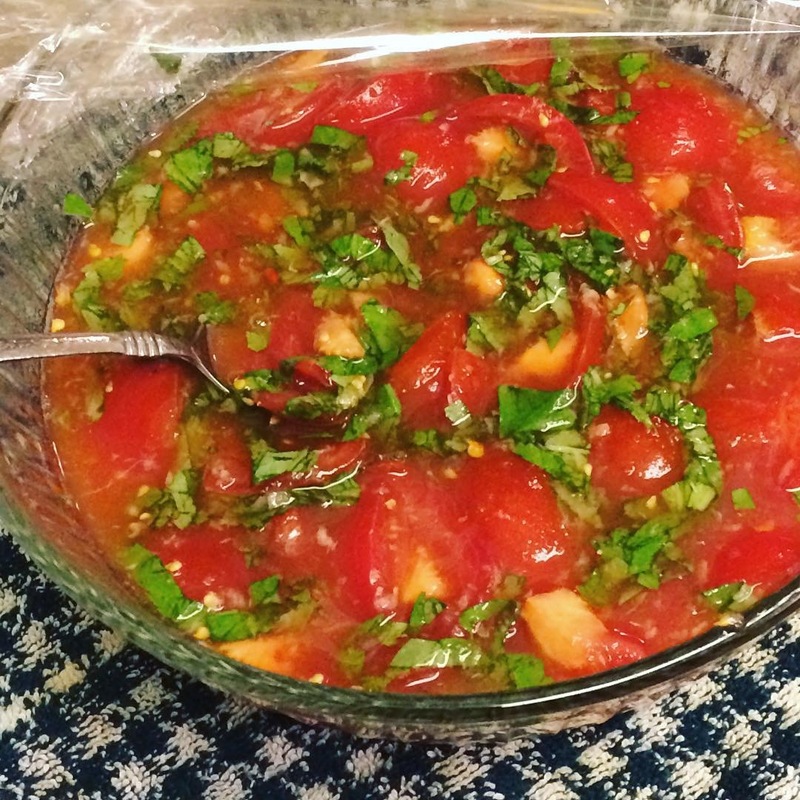 The freshness of the tomatoes and the basil will get you longing for Spring, yet warming you in these cold winter days. Note that whole grain angel hair works great and if you can find capellini, well…it makes it even better! Enjoy this HOW TO recipe (below) and message any feedback and success that YOU had with this recipe. Place all ingredients in a bowl a cover with plastic wrap for 4 hours on counter top. After 4 hours cook the angel hair, drain, reserving a cup of water. 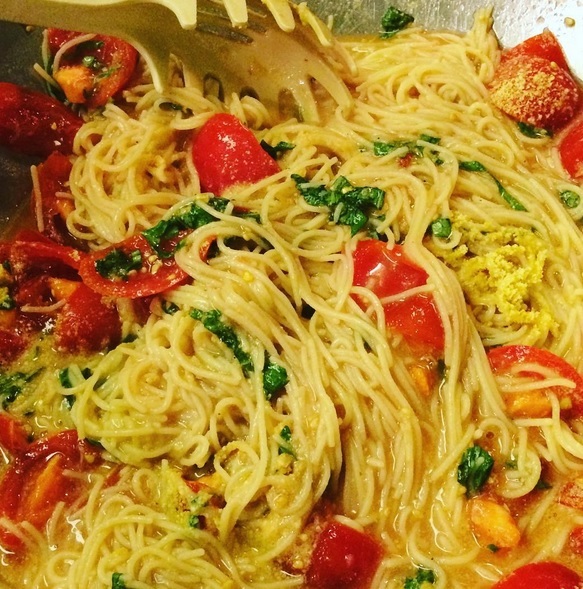 Toss the tomato mixture into the pasta and serve with vegan parmesan and a few more leaves of basil. If too dry, add some pasta water. Plain toasted whole grain bread gones well with this dish or even just a side salad. Great for meatless Monday’s or non-plant based friends or family.